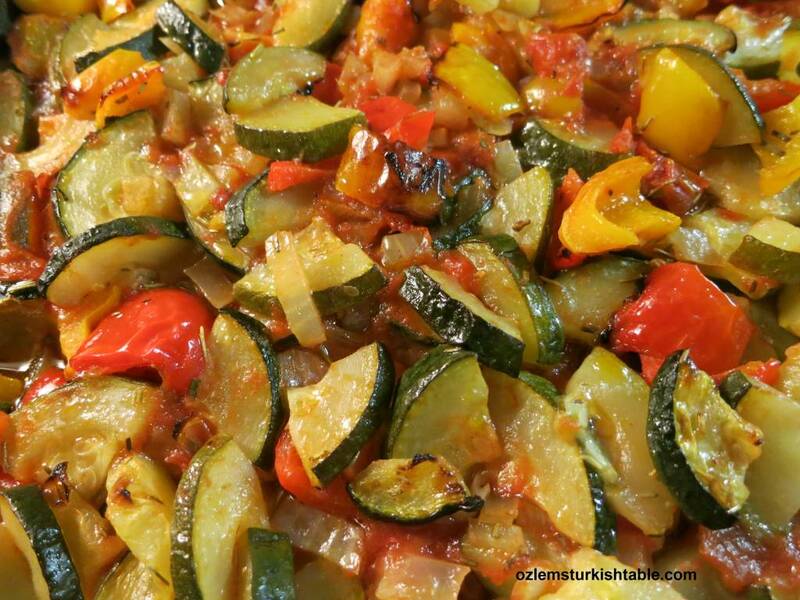 This baked vegetables in tomato sauce with olive oil, Firin Sebze, is a delicious, easy and healthy vegetarian course that we turn to often. Beauty of this dish is that you can use whatever vegetables you have in hand; zucchini (courgettes), peppers, onions, peas, carrots, beetroots, aubergines, beans, potatoes especially work well. In Turkish cuisine, we use tomato based sauces a lot in our casseroles, stews and baked dishes; you can use juicy, ripe tomatoes when they are in season. If you can’t get hold of ripe tomatoes, a good quality canned chopped tomatoes also work very well. For a more substantial vegetarian course, you can add cooked chickpeas to the vegetable mixture here and bake all together. It is a delicious and gluten-free vegetarian course that complements any grills and pasta beautifully; you can also serve this vegetable bake as part of a mezze spread. You can prepare this dish ahead of time and keep in the fridge or freezer. If left in fridge, reheat at the preheated oven at 200 C / 400 F for 15 – 20 minutes. If kept in freezer, reheat at the same temperature for about 30 minutes. I hope this delicious baked vegetables with olive oil inspires for easy, healthy, delicious home cooked meals for you all. 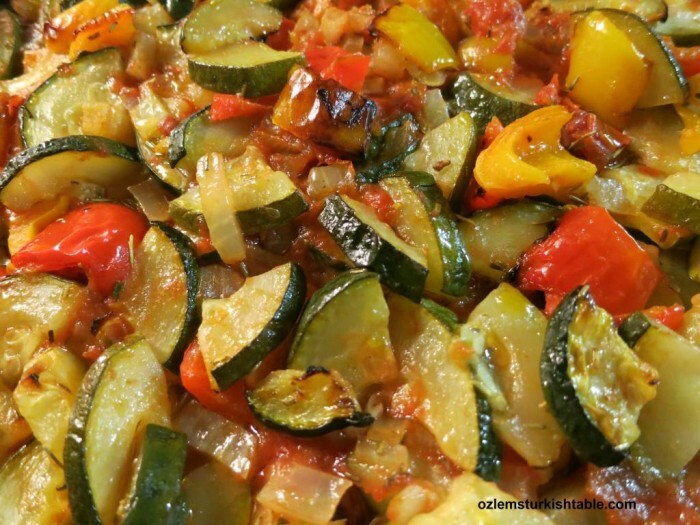 This baked vegetables in tomato sauce with olive oil, Firin Sebze, is a delicious, easy and healthy vegetarian course that we turn to often. Beauty of this dish is that you can use whatever vegetables you have in hand. You can also prepare this gluten-free dish ahead of time and serve as part of mezze spread, or as a side to pasta and grills- Afiyet Olsun! Combine sliced zucchini (courgettes), peppers, onions and garlic on a baking tray. Pour in the olive oil and mix with the vegetables well. Stir in the chopped tomatoes or canned chopped tomatoes, combine well. Stir in the oregano and season with salt and freshly ground black pepper. Combine well. Bake in the preheated oven (200 C/ 400 F), uncovered for 20 minutes. After 20 minutes, give the vegetables a good mix and bake for a further 20 minutes, until they start to chargrill at edges. Serve hot as part of a mezze spread or as a side to pasta and grills. Lovely medley of colors and textures, dear Ozlem. We all need such hearty recipes, especially for weeknight dinners. xxPeri. Perfect sunny food to cheer up a wet and dark autumn. I made this dish with dinner tonight, and it was a huge success! …My first Turkish dish!! Yay!!! We both loved it. Now I’m ready to try another!! Thanks for the recipes and your encouragement!! This looks delicious. I plan to make it and divide it up for work lunches in the future. I’ll probably top it off with some baked tofu or chicken flavored seitan. If you add chickpeas, how should they be cooked? Get them ready cooked in a jar as here in Benicassim, Spain. I added a chill from our neighbours camping pitch, just enough piquancy. I used tomate frito receta artesana, laced with sugar, sweet. Wow the sauce and flavours of the mixed vegetables are great right now. Again one of your fantastic vegetarian dishes! When it came on the table, I could not wait to start eating. Such a dish with a good white bread ( ekmek) is enough for me and I don’t miss any meat! Merhaba Gustav, many thanks! I feel the same and loved this vegetarian dish, so glad you enjoyed it too! Thank you so much for introducing me to turkish cuisine, I made this recipe for the first time it was delicious, and I look forward to introducing your turkish recipes into my dailly meals. So glad you’re enjoying Turkish cuisine David, thank you for your kind note. Can you use fresh oregano? How much should I use? Hi Donna, yes you can – I love oregano and use generously, so it’s a personal taste. For fresh oregano, I would use a small handful, roughly chopped – 1-2 tablespoons, hope you enjoy it. I .made this dish last night and it was absolutely delicious. Everyone loved it even the fussy eaters! I am looking forward to cooking more of you’re delicious recipes. I am new to Turkish cuisine, but want to make this baked zucchini dish for my new sister in law, who is from Turkey. If i make it Friday and cook it, can i serve it cold on Saturday, and if so would i need to reheat it first, or serve it straight from the fridge? I am trying three other Turkish recipes too. Excited to try new cuisine.